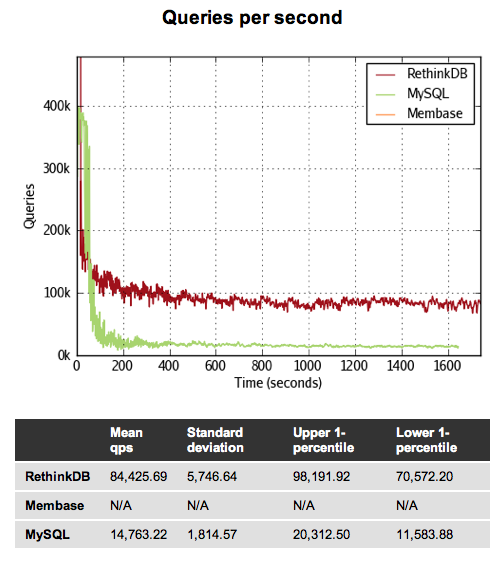 Which brings us to today: RethinkDB has just launched its 1.0 release to the public, and it’s offering a product geared toward NoSQL installations — and it will work on SSDs, traditional drives, and cloud-based services like AWS. The startup has also moved away from MySQL and now fully supports Memcached. Akhmechet says that the main incentive to use RethinkDB is speed — he believes that it’s eight times faster than other solutions on the market. He adds that while it’s “pretty easy to build something that’s faster at one thing, it’s harder to do fast in general. And we’re fast in general.” The company has some detailed benchmarks listed on this page. In addition to improved load times, Akhmechet says that RethinkDB can actually save companies money by reducing how much they need to spend on infrastructure and cloud services (for example, he says you could jump from a high-end node on EC2 to a less expensive tier and achieve the same performance). Provide sophisticated durability tuning and guarantees to allow the administrators full control of performance and durability tradeoffs. Significantly increase performance of your caching and key-value store infrastructure to allow your existing hardware to scale to much higher load. Akhmechet says that the company is in talks with multiple popular sites about deploying their software, though at this point he can’t talk about them. For pricing, RethinkDB is offering both free and premium plans. The free option includes a commercial license and all current features — a premium version, which runs $1500 per machine per year, includes support and all future software updates. Akhmechet says that the free version will get security updates, but that it won’t necessarily receive new features in the ture, whereas the premium version will. There’s also an option for enterprises to purchase at a discount. RethinkDB raised $1.2 million in April 2010 and is currently in the process of raising another round at what Graham says is a surprisingly high valuation.